It may be a failing of my Southern upbringing but I’ve never had Hummingbird Cake. However, when a good friend asked for one for her birthday dinner, I went searching for a recipe to suit. This old style cake has the flavors of pineapple, banana and pecans, with just a hint of coconut. The recipe I used came from Southern Living and, after I made a couple of changes, resulted in a moist cake that was not overly sweet – sort of a dessert banana bread. Grease and flour a bundt pan; set aside. In a large bowl stir together the flour, sugar, baking soda, cinnamon, and salt. Next stir in the eggs, mashed bananas, pineapple, vegetable oil, and vanilla extract; stir just until dry ingredients are moistened. Sprinkle chopped, toasted pecans into the bottom of the bundt pan, spoon the batter over the pecans. Bake for 1 hour to 1 hour and 10 minutes, or until a tester comes out clean. Cool the cake in the pan on a wire rack for 15 minutes; remove from the pan and allow to cool completely on the wire rack. For the glaze, in a bowl combine the softened cream cheese, powdered sugar, vanilla extract and 1 tablespoon milk; mix with a hand mixer until smooth, adding an additional tablespoons of milk if needed. 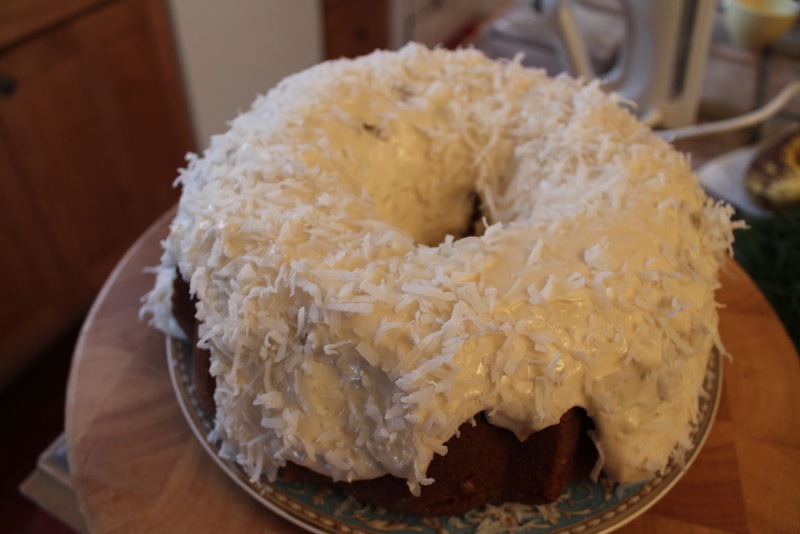 Immediately pour the glaze over the cooled cake, and sprinkle coconut over the top.